Objective A high body mass index (BMI) is associated with an increased risk for severe liver disease. It is unclear if this risk differs across BMI categories, and if the association is partially attributed to development of type 2 diabetes mellitus (T2DM). Design We used register data from more than 1.2 million Swedish men enlisted for conscription between 1969 and 1996. Data regarding new events of severe liver disease and T2DM during follow-up were obtained by record-linkage of population-based registers. We used Cox regression to estimate adjusted HRs for future inpatient care and mortality in severe liver disease and incidence of hepatocellular carcinoma (HCC) across BMI categories, using BMI of 18.5–22.5 kg/m2 as reference. Results During a follow-up of more than 34 million person-years, 5281 cases of severe liver disease including 251 cases of HCC were identified. An association with severe liver disease was found for overweight (HR 1.49, 95% CI 1.35 to 1.64) and for obese men (HR 2.17, 95% CI 1.82 to 2.59). Development of T2DM further increased the risk for severe liver disease across all BMI categories, for instance, men with obesity and T2DM had a higher risk of severe liver disease (HR 3.28, 95% CI 2.27 to 4.74) than men with obesity free of T2DM (HR 1.72, 95% CI 1.72 to 2.54). Conclusions A high BMI in late adolescent men was associated with an increased risk of future severe liver disease, including HCC. Development of T2DM during follow-up was associated with a further increased risk of severe liver disease, independent of baseline BMI. Overweight and obesity is increasing in prevalence worldwide. 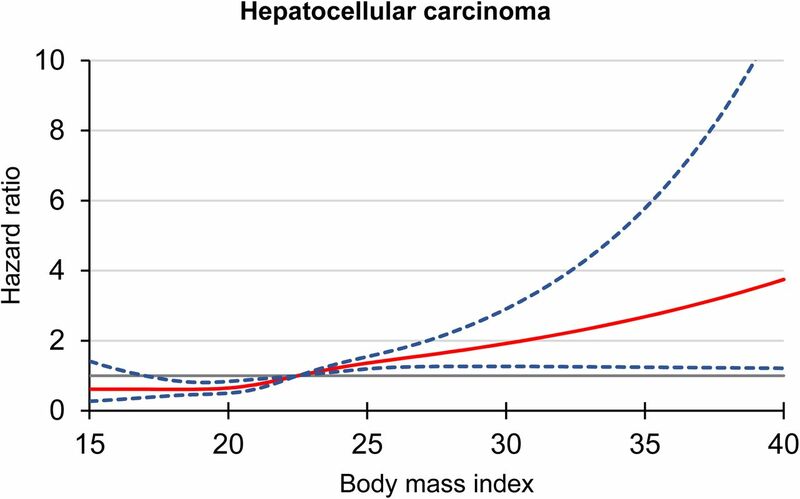 A high body mass index (BMI) is associated with an increased risk for future severe liver disease and hepatocellular carcinoma in adults. A high BMI also increases the risk for type 2 diabetes mellitus (T2DM), which in turn is associated with an increased risk of severe liver disease. High BMI in late adolescence is associated with future severe liver disease in a non-linear relationship. This risk is even higher in men who also develops T2DM, but also relevant in men who do not develop T2DM. High BMI in late adolescence is also associated with an increased risk of subsequent hepatocellular carcinoma. Men who are overweight in young adulthood should be informed about an increased risk of future severe liver disease, including hepatocellular carcinoma. This could affect future public health decisions. Men who develop T2DM, independent of BMI early in young adulthood or midlife, is at increased risk of severe liver disease, should be informed of this risk and possibly screened for presence of manifest liver disease to prevent future mortality in liver disease. However, obesity also increases the risk of development of type 2 diabetes mellitus (T2DM),13 which in turn is associated with severe liver disease and HCC.14 ,15 It is unclear if the long-term risk for severe liver disease, in addition to having a high BMI, is further increased by development of T2DM. It has recently been shown that a high BMI in late adolescent men is associated with an increased risk of death in or hospitalisation for end-stage liver disease,16 even when adjusting for known confounders including alcohol consumption, smoking and use of narcotics. However, this study was performed in adolescent men who underwent conscription to military service in 1969–1970, when overweight and obesity were relatively uncommon,17 and only 0.8% of that cohort was classified as obese (BMI >30 kg/m2). Also, although the study included close to 50 000 men, it was underpowered to examine the association between BMI and HCC. Here, we study the association between BMI and future severe liver disease in adolescent men using a large, population-based cohort, to test the hypothesis that the association between BMI early in life and severe liver disease differs across BMI categories, including an increased risk of HCC, and that development of T2DM during follow-up further increases the risk of severe liver disease. This study is based on males born in Sweden between 1951 and 1976 who underwent conscription into military service between 1969 and 1996 (N=1 256 461). During this time, conscription was mandatory and only 2%–3% of the male population was exempted, mostly due to handicaps or severe diseases. At the time of conscription, the men underwent extensive physical and cognitive testing, which has been described in detail elsewhere18 and is explained in further detail in the online supplementary appendix. Our analytical sample with complete data on all covariates consists of 1 220 261 men aged 17–19 years. BMI was defined as weight (kg) divided by height (metres) squared. The men were allowed light clothing without shoes. Systolic and diastolic blood pressures were measured after 5–10 min of rest in the supine position, with an appropriately sized cuff at heart level, and measured in mm Hg. A test of cognitive ability was performed as described elsewhere,19 ,20 which is defined as a stanine score (normal distributed with mean 5, range 1–9). This is explained in further detail in the online supplementary appendix. Cardiovascular fitness was tested using an ergometer cycle where the men's maximum work capacity was assessed (measured in watts). Muscular strength was measured as described elsewhere.21 In brief, a measure of total muscular strength is constructed from the three separate isometric muscular tests hand grip, elbow flexion and knee extension (measured in Newton). The procedures are explained in further detail in the online supplementary appendix. Information on parental socioeconomic status (SES) in childhood was obtained from The National Population and Housing Censuses (PHS) 1960–1990 at approximately 10 years of age. We used highest parental SES categorised as higher level non-manuals, middle level non-manuals, lower level non-manuals, skilled workers, unskilled workers and others. For descriptive purposes, we defined high SES as higher-level or middle-level non-manuals. Record linkage was also made with the longitudinal integration database for health insurance and labour market studies to obtain data regarding own and parental achieved education. Parental education was also collected from the 1970 PHS and we used the highest of either parent. Education was categorised as having a higher postsecondary education, secondary or primary education. The personal identification number (PIN) is a unique 10-digit code provided to all Swedish citizens a few days after birth.22 The PIN was used to link the conscription cohort to three national, population-based registers. We used outcome data from the National Patient Register of Hospital Discharges (NPR), from the Cause of Death Register (CDR) and from the Swedish Cancer Register (SCR). The validity of hospital discharge diagnoses obtained from the NPR is between 85% and 95% depending on diagnosis.23 The CDR contains data regarding the causes of death of all Swedish citizens, including if the person died abroad. It is mandatory for the responsible physician to report the underlying cause of death (eg, HCC) and any disease that could have contributed to the death of the individual (eg, liver cirrhosis). The SCR contains data on verified solid and non-solid tumours, irrespective of the diagnostic modality. The completeness of the register is high, capturing around 96% of all diagnosed tumours.24 Follow-up started 1 year after conscription and ended in 31 December 2012. Data from SCR were available up to 31 December 2010. Subjects who received a diagnosis of severe liver disease before or up to 1 year after date of conscription were excluded. Diagnoses of liver cirrhosis, HCC, decompensated liver disease (ascites, oesophageal varices, hepatorenal syndrome or hepatic encephalopathy) or liver failure, malignancies of the bile ducts and gall bladder, portal hypertension, liver transplantation and paracentesis (as a proxy for ascites) from the NPR and SCR, or death from any of the above diagnoses as underlying or contributory cause of death in the CDR were used to define our primary end point variable severe liver disease. International Classification of Diseases (ICD) codes for the diagnoses used in the present study are listed in the online supplementary appendix. Additionally, we examined if the association between BMI and severe liver disease was different in persons who received a diagnosis of T2DM or not during the study period. This was defined as having a diagnosis of T2DM according to ICD 10 in the NPR before or at the time of diagnosis of severe liver disease. For ICD 8 and 9, there is no distinction between type 1 diabetes mellitus and T2DM, and thus we defined T2DM as a first coding for diabetes after the age of 40. However, in a sensitivity analysis we restricted the analysis to cases with a T2DM diagnosis in ICD 10. BMI was tested both as a continuous and a categorical variable, stratified as <18.5 kg/m2, between 18.5 and 22.5 kg/m2, which was used as the reference category, between 22.5 and 25 kg/m2, between 25 and 30 kg/m2 and ≥30 kg/m2. We used Cox proportional hazards models to estimate HRs with 95% CIs for the associations of BMI and respective outcome. Risk time was calculated as time from conscription to time of any of the outcomes, deaths in other causes, emigration or end of follow-up (31 December 2012), whichever came first. Models were adjusted for the following potential confounding factors: birth year, conscription centre, own education, parental education and childhood SES and lastly for cognitive ability, cardiovascular fitness, muscular strength, systolic and diastolic blood pressure. We hypothesised that development of T2DM might be a part of the causal pathway for severe liver disease, and thus should not be adjusted for in statistical modelling. Statistical interaction between BMI and T2DM was instead investigated using a multiplicative interaction term between BMI categories and subsequent development of T2DM for severe liver disease. To further explore the shape of the associations, we also used restricted cubic splines of BMI with four knots placed at the 5th, 35th, 65th and 95th percentiles, which are presented in figure 1. The spline models are fully adjusted using the same covariates as described above. Stata V.13 (StataCorp) was used for the statistical analyses. HRs with 95% CIs (BMI=22.5 kg/m2 as reference) for development of severe liver disease (N=5.281), using baseline data on BMI from 1 220 261 Swedish adolescent men enlisted for conscription during 1969–1996 and followed for 34.8 million person-years. Restricted cubic splines was estimated with Cox proportional hazards regression models (adjusted for birth year, conscription centre, own education, parental education and childhood SES, cognitive ability, cardiovascular fitness, muscular strength, systolic and diastolic blood pressure, all measured at baseline). BMI, body mass index; SES, socioeconomic status. Since our cohort comprised men aged 18–19 years at baseline, reverse causality of high alcohol consumption on BMI should be less of a problem than in cohorts with baseline BMI assessed later in life. However, it is possible that development of viral or autoimmune liver disease during follow-up may have influenced strength of associations between BMI and the outcome variable. Thus, in sensitivity analysis, we first excluded all men who received a diagnosis associated with alcohol use disorder, alcoholic liver disease, viral and autoimmune hepatitis from the analysis of BMI on severe liver disease. Additionally, we investigated the risk of a high BMI specific for cases who did develop any of these specific liver diseases. We also performed sensitivity analyses to specifically investigate the association of BMI with and specific coding for liver cirrhosis and decompensated liver disease (defined as ascites, oesophageal varices or liver encephalopathy). Furthermore, in additional sensitivity analysis we excluded persons who received any of the studied outcomes within 3 years after baseline. Lastly, we investigated the associations between muscular strength and cardiovascular fitness with severe liver disease and HCC across BMI categories. This study was approved by the Ethical Review Board in Stockholm (dnr 2016/1773-31/2). Mean BMI at conscription was 21.6 kg/m2 (SD 2.8), with 104 137 men being overweight (BMI 25–25 kg/m2, 8.5%) and 19 671 men being obese (BMI ≥30 kg/m2, 1.6%). Descriptive statistics at baseline is presented in table 1. Mean BMI increased from 20.9 kg/m2 for men born in 1951 to 22.3 kg/m2 in men born in 1976 (p<0.001). During the same period, the prevalence of overweight increased from 5.7% to 12.0% (p<0.001) and obesity from 0.8% to 2.8% (p<0.001). The cohort was followed for a mean period of 28.5 years (SD 8.3, range 0–42), corresponding to 34 800 419 person-years with respect to severe liver disease. During this time, there were 5281 cases of severe liver disease, including 251 cases with HCC. Also, 38 557 men (3.2%) died from causes other than severe liver disease and 67 259 men (5.5%) emigrated and were censored, but contributed with follow-up time up to death or emigration. Crude incidences for severe liver disease as stratified by birth cohort, 1951–1959 and 1960–1976, were substantially higher in the older birth cohort (see online supplementary table S2). 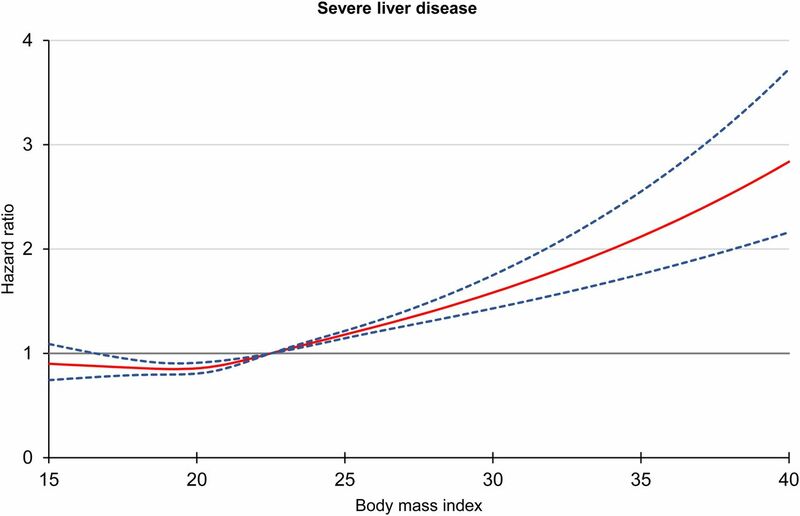 BMI was associated with an increased risk of severe liver disease, both when tested as continuous and as a categorical variable. As shown in figure 1, BMI had a non-linear positive association with severe liver disease, as with most other outcomes, and the increased risk was most evident for obese men. When compared with the 18.5–22.5 kg/m2 category in fully adjusted analyses, the risk of severe liver disease increased with a higher BMI, which could be seen in men with a BMI of 22.5–25 kg/m2 (HR 1.17, 95% CI 1.09 to 1.26, p<0.001), BMI 25–30 kg/m2 (HR 1.49, 95% CI 1.35 to 1.64, p<0.001) and was greatest in men with an BMI of ≥30 kg/m2 (HR 2.17, 95% CI 1.82 to 2.59). Men with a BMI <18.5 kg/m2 did not have an increased risk of severe liver disease (HR 1.02, 95% CI 0.9 to 1.11, p=0.74). Data on crude and adjusted HRs stratified per BMI category are presented in table 2. A diagnosis of T2DM was obtained in 16 451(1.3%) men during follow-up, of which 957 (5.8%) only had an ICD 8 or 9 diagnosis. Using men without T2DM with a BMI of 18.5–22.5 kg/m2 as the reference category, an increased risk of severe liver disease was seen across all BMI categories in men who received a T2DM diagnosis. For instance, the risk of severe liver disease in men without a T2DM diagnosis and a BMI of ≥30 kg/m2 was increased (HR 2.09, 95% CI 1.72 to 2.54), but for men with a BMI of ≥30 kg/m2 and T2DM the risk was even higher (HR 3.28, 95% CI 2.27 to 4.74). Data on the risk of severe liver disease, stratified per BMI category and T2DM diagnosis are presented in table 3. However, in men free of T2DM the association between a high BMI and severe liver disease was still evident in a dose-response manner. In fully adjusted analyses, the risk of HCC increased with a higher BMI, seen both for the BMI 22.5–25 kg/m2 category (HR 1.28, 95% CI 0.91 to 1.80. p=0.16), the 25–30 kg/m2 category (HR 1.57 95% CI 1.01 to 2.45, p=0.045) and for the ≥30 kg/m2 category (HR 3.59, 95% CI 1.85 to 6.99, p<0.001) (table 2 and figure 2). In general, most cases of HCC were found in the oldest birth cohort, born in 1951–1959 (see online supplementary table S2). There were too few cases of HCC for stratification on T2DM status. HRs with 95% CIs (BMI=22.5 kg/m2 as reference) for development of hepatocellular carcinoma (N=251), using baseline data on BMI from 1 220 261 Swedish adolescent men enlisted for conscription during 1969–1996 and followed for 34.8 million person-years. Restricted cubic splines was estimated with Cox proportional hazards regression models (adjusted for birth year, conscription centre, own education, parental education and childhood SES, cognitive ability, cardiovascular fitness, muscular strength, systolic and diastolic blood pressure, all measured at baseline). BMI, body mass index; SES, socioeconomic status. Excluding men who received a diagnosis associated with alcohol use disorder, alcoholic liver disease, viral or autoimmune hepatitis during follow-up did not change the risk estimates for severe liver disease significantly for BMI 25–30 kg/m2 (HR 1.66, 95% CI 1.48 to 1.86, p<0.001) or for men with a BMI of ≥30 kg/m2 (HR 2.22, 95% CI 1.78 to 2.76, p<0.001). In men who subsequently received a diagnosis of viral hepatitis, overweight (HR 1.80, 95% CI 1.30 to 2.49, p<0.001) and obesity (HR 2.03, 95% CI 1.27 to 3.24, p=0.003) was associated with severe liver disease. The same association was found for obesity in men who received a diagnosis of alcoholic liver disease (HR 1.87, 95% CI 1.28 to 2.71, p=0.001), while no association between a high BMI and severe liver disease was found for men with a subsequent diagnosis of autoimmune liver disease (HR for obesity 1.27, 95% CI 0.24 to 6.75, p=0.78). Exclusion of individuals with first event within 3 years after conscription did not change any result (data not shown). Restricting the outcome to either cirrhosis or decompensated liver disease yielded fewer outcomes, but did not change the main results (see online supplementary appendix, table S3 and figures S1 and S2). Defining T2DM as a diagnosis restricted to ICD 10 yielded very similar estimates as the main analysis (see online supplementary table S4). A higher BMI was associated with an increased risk of severe liver disease in all quartiles of muscular strength and cardiovascular fitness. However, cardiovascular fitness and to a lower extent muscular strength seemed protective against severe liver disease and HCC, although too few cases of HCC were found in most BMI categories for a robust analysis. These data are presented in the online supplementary table S5 and S6. In this large, population-based cohort of more than 1.2 million men, BMI was highly associated with severe liver disease. A dose- response relationship with the highest risk seen in obese men was found (HR 2.17, 95% CI 1.82 to 2.59) compared with normal weight men. Furthermore, this risk was not attenuated when excluding men with diagnoses of any other liver disease or alcohol use disorders (HR 2.26, 95% CI 1.78 to 2.76) during follow-up, indicating that the excess risk is not attributed to reversed causality or development of concurrent liver diseases during follow-up. Strikingly, the risk of severe liver disease was highly affected by a diagnosis of T2DM during follow-up, across all BMI categories. For instance, the risk of severe liver disease was moderately increased in men with a BMI of ≥30 kg/m2 free of T2DM (HR 2.09, 95% CI 1.72 to 2.54), but substantially higher in men with a BMI of ≥30 kg/m2 and T2DM (HR 3.28, 95% CI 2.27 to 4.74). T2DM has consistently been shown to be associated with an increased risk of cirrhosis14 ,25 and our results show that this is the case irrespective of the BMI in late adolescence. However, an increased risk for severe liver disease was also seen in a dose-response manner for a higher BMI in men free of T2DM during the follow-up, suggesting that the association between a high BMI in late adolescence and future severe liver disease cannot solely be explained by development of T2DM. The excess risk of a high BMI was stable across quartiles of muscular strength and cardiovascular fitness. However, in particular cardiovascular capacity seemed to be protective against severe liver disease, and also against HCC in the largest group of men with BMI 18.5–22.5 kg/m2, indicating that the excess risk of a high BMI can be somewhat modified by exercise, but not nullified. The association between a high BMI and NAFLD is strong,3 ,4 and it is likely that part of the association between adolescent high BMI, T2DM and future severe liver disease and HCC is attributable to development of NAFLD. In fact, around 70% of subjects with T2DM will have NAFLD.34 Also, as stated above excluding cases with a diagnosis of viral, alcoholic or autoimmune liver disease did not change the results significantly, indicating that the main driver of severe liver disease in adolescent men is likely NAFLD. The primary strengths of the current study are the population-based design, allowing capture of around 97% of the Swedish male population conscripting during 1969–1996. This minimises risk of selection bias, and strengthens external validity. We also display a very long follow-up time (>34 million person-years), which allows for enough cases for precise estimation of the HRs. Also, examining men in young adulthood minimises the risk of reverse causality regarding alcohol, since long time use of alcohol per se can also influence BMI. We had access to detailed and credible baseline data regarding exposure status (objectively measured height and weight) on almost the entire male population from the study period. Furthermore, outcomes were ascertained through high-quality national, population-based registers, and the selection of hard end points including liver decompensation and HCC, which almost always leads to hospitalisation, and death in liver disease assures that bias regarding the outcome of severe liver disease and HCC should be minimal. Our study also has some limitations. We were unable to study the association between BMI and subsequent liver disease in women. However, similar results have been shown in a large cohort of middle-aged women in UK,27 although the risk was uncertain for young women. Also, changes in BMI during the follow-up period could not be ascertained. As mentioned above, our analyses accounted for an increase in prevalence of overweight and obesity in Swedish men during the last decades in Sweden.17 It seems highly unlikely that a substantial part of the cohort have reduced their BMI during follow-up. However, our results show that the long-term risk of a high BMI early in young adulthood is associated with a higher risk for severe liver disease and HCC, indicating that the duration of being exposed to a high BMI is of importance for the excess risk. We did not have data on alcohol consumption or smoking at baseline in this cohort. However, excluding men who received a diagnosis of alcoholic liver disease during follow-up did not attenuate the excess risk associated with high BMI in this study. Also, it was recently shown in a subset of this cohort with available data on alcohol consumption and smoking at the time of conscription, that these risk factors could not explain the association between a high BMI and future severe liver disease.16 The validity of the population-based registers used for ascertainment of outcomes is high,23 but due to the fact that primary care is not included, we might have missed cases of T2DM who have been followed only in primary care during the follow-up. Thus, the association between BMI, T2DM and severe liver disease is generalisable only to men who are seen in specialist care, or have been hospitalised with a concurrent T2DM diagnosis. This could potentially introduce detection bias, as hospitalised patients are more likely to be screened for presence of T2DM. Lastly, there were not enough cases of HCC to allow for stratification on T2DM status. In this large population-based study of more than 1.2 million men, higher BMI in young adulthood was strongly associated with an increased risk of subsequent severe liver disease and HCC. This risk was most pronounced in men with concurrent T2DM. Interventions to reduce the increasing prevalence of overweight and obesity should be implemented from an early age to reduce the future burden of severe liver disease on individuals and society.
. Is obesity a risk factor for cirrhosis-related death or hospitalization? A population-based cohort study. Gastroenterology 2003;125:1053–9. Correction notice This article has been corrected since it published Online First. Reference 30 has been updated. Contributors Study conception and design: HH, PT, FR. Acquisition of data: FR. Statistical analysis: PT. Analysis and interpretation of data: HH, PT, FR. Drafting of manuscript: HH. Critical revision: HH, PT, FR. Funding HH was supported by grants from the Royal Swedish Academy of Sciences. Ethics approval The Ethical Review Board in Stockholm. Data sharing statement All data for this paper are presented in the submission. All authors had complete access to data during the process.